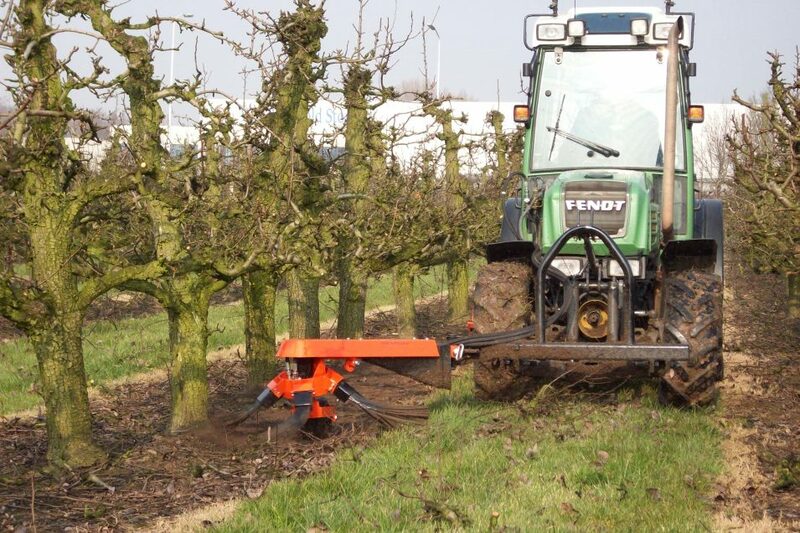 The Perfect double brush sweep for tractor front mounting has been developed to work in orchards and vineyards and the standard machine works in row widths from 2.80 to 4.10 metres (9’2” – 13’5”). 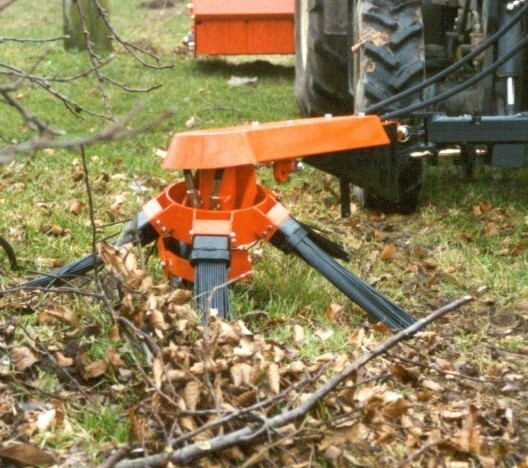 It is used to clear the tree row strips from leaves, remaining fruit, prunnings and any other debris, therefore leaving a clean strip which will in turn reduce the risk of fungus and disease developing. New for 2016 is a version using smaller diameter (580mm rather than 1300mm) sweep heads to allow the machine to be used in narrower plantings. The brushes are made of highly resistant synthetic material and spin at approximately 140 to 160 rpm. Some growers prefer a system using rubber ‘paddles’ rather than brushes so this is available as an option. 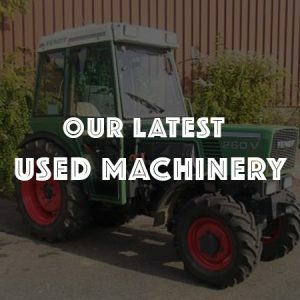 For perfect terrain adjustment each sweep head has a support swivel wheel, along with hydraulic rams to adjust the working width and lift the sweeper into transport position. As the brush sweeps are mounted at the front of the tractor, it is possible to use the machines in combination with a rear mounted pulveriser. Therefore in one pass the row has been completely cleared of leaves, prunnings and debris. 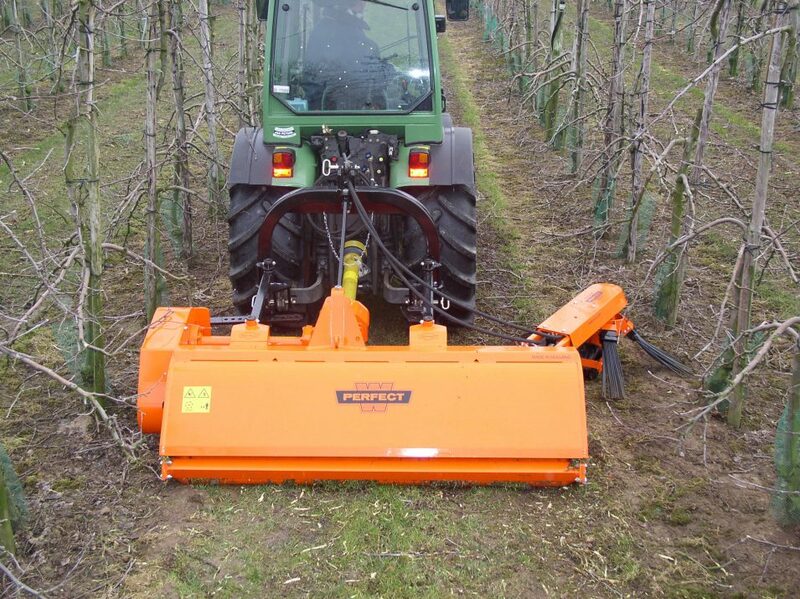 The brush sweep is also available single sided for front mounting or can be mounted on a rear mounted pulveriser.